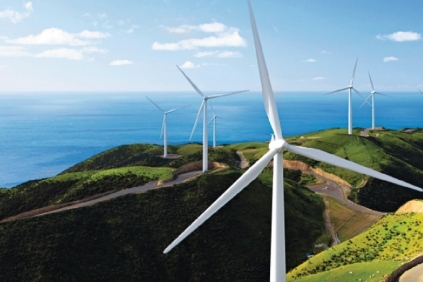 GERMANY: With around a dozen wind turbine manufacturers and more than 80 that make systems and components for turbines, Germany plays a leading role in the world's wind energy sector. The country has built a reputation for quality and cutting-edge technological prowess, and key to its future success is to remain a melting pot for development and improvement of wind engineering and expertise. Although its share of the world wind turbine market has been steadily falling in recent years, this is not a bad thing, says Thorsten Herdan, managing director of the power systems division at major German engineering federation VDMA. Wind turbine and component manufacturers in Germany accounted for 17.5% of the world wind turbine business total of €36.3 billion in 2009, according to the VDMA. In 2007, German output had accounted for 28% of the world total of €22.1 billion. In 2005, the German share had been considerably higher at 38%, although overall global business at €10.6 billion was less than a third of what it is today. But the decline in market share is not necessarily cause for concern, says Herdan. "On the contrary, we hope Germany does not continue at its current position because this either means the world market is not going to expand much or the German wind manufacturing sector will grow disproportionately large," he explains. Too large a manufacturing capability would be vulnerable to swings in the economy as big chunks of production facilities might have to be left idle in periods of financial downturn. Germany’s export status is built on the country’s "first mover" advantage in the early years of wind energy. The German support mechanism for renewable energy has run for 20 years, from a 1991 law on feed-in to the public transmission network, to the 2000 Renewable Energy Act’s stable feed-in tariff system. This has allowed the wind sector to develop a stable turbine manufacturing branch with a component supply chain serving domestic and Danish markets. As markets elsewhere opened up, German technology was used until the countries’ industrial sectors gradually began to build up their own turbine manufacturing. Even now, however, exports account for by far the largest share of German turbine manufacturers’ sales. Of the total €6.35 billion in sales in Germany in 2009, three-quarters (€4.7 billion) came from sales abroad. The German government has been consistently keen to support this export effort. A 2020 renewable energy export initiative set up by the federal economic ministry supports in particular, small and medium-sized firms wishing to gain a foothold and grow business abroad. German suppliers’ export strategies vary. Global giant Siemens focuses on major projects, which makes more sense for its large manufacturing and administrative apparatus. This explains its relationship with US utility MidAmerican Energy, from which it won an order for 258 wind turbines last December, and its offshore deals with German energy firm ENBW and Danish Dong Energy. Medium-sized manufacturers with smaller resources like Nordex tend to pick a handful of countries on which to focus exports. Smaller turbine company Fuhrländer uses its flexibility to enter pioneer markets such as Rumania, Bulgaria, the Ukraine, South Africa and Vietnam, as well as Brazil. Component suppliers such as SKF, Bosch Rexroth and Rote Erde go into foreign markets like China, where they do not necessarily compete directly with domestic companies. German tooling machine manufacturers that make the machines to produce components have being supplying their products to other countries for the past 100 years, Herdan adds. Research and development will continue to play a vital role in maintaining foreign interest in German wind technology and the domestic market provides the testing ground for new developments and a showcase for new turbine models. "Germany can only stay at the forefront by always being a step ahead in technology, be it in improved life-cycle cost factor, machine availability, or accessibility for maintenance. Otherwise in time, it will drop out of the game," Herdan observes. An important strategy is to maintain and further develop close ties with research departments at universities. In February, Nordex endowed a wind power engineering professorship at the faculty of mechanical engineering and marine technology at Rostock university. The company is interested in establishing research partnerships there, some of which could be undertaken at Nordex’s own laboratories. The turbine builder says it has been investing heavily in laboratory and testing equipment in order to speed development of new turbines and to enhance product quality. German turbine manufacturers and component suppliers also combine their resources to drive ahead technological improvement. Last year, turbine builder Repower Systems, gearbox supplier Eickhoff Antriebstechnik and gearbox bearings manufacturer Schaeffler Gruppe Industrie worked together to develop a multi-body simulation system to calculate the dynamic operational loads on wind turbine drive trains. From a logistical point of view, a wind turbine industry founded on manufacturing expertise gained in other industry branches and initially aimed at the home market is not necessarily well placed geographically for a switch to exports. But Germany’s highly developed infrastructure makes exports viable even from deep in the interior of the country. The network of motorways, canals, rail and rivers, particularly the river Rhine, allows companies such as Siemens-owned gearbox builder Winergy to export from the Ruhr industrial region. GE Wind delivers turbines abroad from its facility in inland Lower Saxony, while Enercon and Eickhoff have factories in eastern Germany. Increasingly, however, factories are clustering around Germany’s North Sea and Baltic Sea ports. At the North Sea port of Bremerhaven for instance, established turbine builders Areva Wind and Repower Systems have set up assembly facilities alongside relative newcomers Innovative Wind Power and PowerWind. PowerBlades, a joint venture between Repower and SGL Rotec, is also situated in Bremerhaven, as are offshore foundation manufacturer Weserind and steel tower producer Ambau. This move towards ports conveniently located for export could reflect doubts about the domestic wind market. But opinions are divided about how the market will develop. The government’s 2010 National Renewable Energy Action Plan foresees 18GW of new capacity, onshore and offshore, being commissioned up to 2020. This is optimistic in view of the market in 2010, when only 1.5GW was installed instead of the expected 1.9GW. The German wind energy association has expressed concern, stressing the need to support the domestic market. "The US experience in 2010, when installations halved to 5,115MW compared with the previous year, cannot be allowed to happen in Germany," it said, adding that such uncertainty would be highly damaging for development of the wind sector. Today, Germany’s impact on wind turbine design is substantial but this has been the case for the past century. During the 1930’s, famous German engineer-inventors like Hermann Honnef designed large multi-rotor turbines to benefit from strong winds at high altitudes. Striking in many multi-rotor concepts is the amazing eye for detail. Honnef designed a wind turbine comprising three rotors, two in parallel and a third central rotor at a second higher level, and a single central ring generator. In the years after World War II, aerospace engineer Professor Ulrich Hütter’s research is remembered for important strides forward in the field of rotor aerodynamics and blade construction. His most famous model is the 1957 W-34 turbine with a two-blade downwind rotor designed for maximum energy capture at low- and medium-wind speed sites. His contributions are said to have helped shape today’s wind industry. The progress of new industry entrants like those in Asia would have been much slower without technical and other support from experienced design firms and component suppliers from abroad. Many of these new players’ first-generation turbine designs are based on technology licenses and, in fewer cases, on dedicated third-party designs. German technology providers like Aerodyn Energiesysteme have played a key role. Its patented 5MW Multibrid turbine is a hybrid of a multi-stage geared and direct-drive non-geared systems. Another example is turbine supplier Fuhrländer, which has issued licenses for its FL1500 and FL2500 (left) models to China’s Sinovel and A-Power respectively. For second-generation turbine designs, relatively new entrants may choose in-house design or technology partnerships, but German firms are often partners for providing high-quality main components.